Obviously increasing the magnification further will most likely reduce your field of view, but as you say if you are in wide open areas and viewing over larger distances, this could still be ok.
Increasing the magnification also magnifies any movement or shaking, which can lead to it being quite difficult to keep the image still. Even tiny movements in the view can make it quite hard to then observe fine details, especially over long distances, which negates the advantage of a bigger magnification. With a 12x bino, most people are still ok over shorter time periods, but not a great choice if you have shaky hands or look through your bins for long periods standing up. Most 50mm binoculars are also reasonably heavier than 42mm ones, which could be get tiring to hold over long times, this combined with the 12x magnification could lead to image shake for some people – just something to keep in mind. Thanks, I’ll check them out and see if it works or, if for me, I’m better off with a 10x50 or 10x42. Thanks again! You are most welcome and please do let me know which you ultimately opt for and how well you get on with them. I will, definitely. I ordered a Celestron Skymaster 12x60 (still get 5mm exit pupil, an acceptable 278 FOV at 1000, and 26.8 twilight) that should arrive in a week. It’s heavier at 3.3lbs but at least I’ll know for sure if it works for me and my situation. I live in CA near open scrub oak and chaparrals. Got to try to know for sure. If it’s too much I can always return and get a 10x50 or 10x42 and then I won’t wonder what if. I was out for a couple hours yesterday and I love my 8x24s for spotting, for watching birds in flight or birds perched within 20-30 yards, but there were definite times when I wished I had more magnification for those farther away, or just to get a larger image, especially for the smaller birds. I’ve had my Celestron 12x60 for almost a month now so here is my analysis. They are significantly bigger and heavier than 8x24s (at 3.3.lbs) but we already knew that would be the case. PROS: For me, I can still hold them pretty still and I get great images with it (1-4 minutes.) Although I find with this size its ideal to be able to brace yourself for longer viewing (4 min or more). In the open environment I am in they work amazingly well for spotting over distance. However, if I know there is is significant cover I’ll opt for my 8x24 instead. Even with the reduced FOV (when compared with an 8x or 10x) I am still able to pick birds (hawks, crows, sparrows and jays) out in flight and get focused on them pretty quickly and see a great amount of detail. Because of the 60mm objective lens I still have 5mm exit pupil and my images are very bright and work well in the evening. Because of the magnification and size these are also great for looking at the moon. I really like these binoculars. Cons: Size. They are big. They are not lightweight by any means and while I don’t mind hiking with them, I could see how others might not like having a large set like these. When hiking I carry my Cannon with a 55-250 lens and these so it can get a tad cumbersome on longer hikes. In conclusion while I do really like these I can see why the 10x42s probably are the sweet spot for most people in a variety of terrain. Now that I’ve had experience with my 8x24 and my 12x60 if I ever decide to really spend some money and get a nice pair they will be 10x42 most likely. I am considering a new set of binoculars. I have always had 8/40s for bird watching, which has worked well. After reading your helpful reviews, I am still wondering. I have seriously looked at the Vanguard Endeavorll10X42 and the reviews are good. But I worry that I may be making a mistake by going toward the 10x42 from 8X40. We are planning a trip to AZ and the Grand Canyon soon and I would like to be able to clearly see the birds we encounter in an unfamiliar environment. As I have gotten older clarity can be an issue; I wear contacts not glasses which helps. But since I only buy new binoculars about once every 15 years, I am nervous that I will choose the not-as-great item ( I rarely have a bit of cash to put toward this sort of luxury item). I am wondering if you could share your thoughts. I know you already have given me a LOT of information, wonder if some new thoughts, or old rethoughts might occur. Thank you for your help. 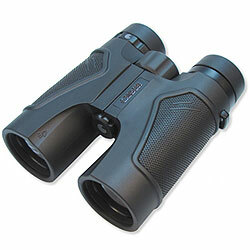 Many thanks for your comment, I have now updated this article to include 8x40 binoculars a comparison and as an option. I think the most important factors you need to consider when choosing between an 8x40, 8x42 and a 10x42 is the field of view, image brightness and size of binocular. If you are concerned with the brightness and field of view, why not get an 8x42, that way you are not sacrificing FOV and should guarantee a brighter image in low light so long as you go for a bin with good quality optical components. Hope this helps. One factor not discussed was the minium focusing distance which is important to me since I can sit on my patio and observe the birds at my feeders in great detail. My 2 pair binos Celestron Granite 8x42 and Nikon Monach 5, 12x42 have a mfd of about 6 ft which I really appreciate.